Arabisk. Kyst eller bred, en kystlinje til Saharaørkenen. Også geografisk region i Afrika. Sahel omfatter (fra vest til øst): Senegal, Det sydlige Mauretanien, Mali, Burkina Faso, det sydlige Algeriet, Niger, det nordlige Nigeria, Tchad, det nordlige Cameroun, Sudan (herunder Darfur og den sydlige del af Sudan), samt Eritrea. Arabic. Coastal or wide, a coastline to the Sahara Desert. 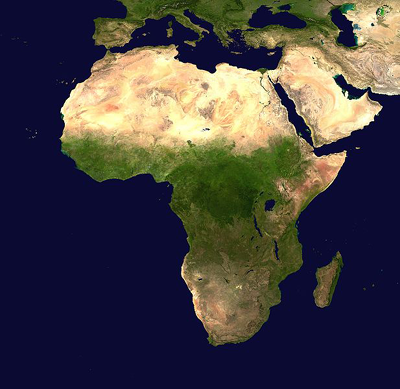 Also geographical region in Africa. Sahel include (from west to east): Senegal, Southern Mauritania, Mali, Burkina Faso, southern Algeria, Niger, northern Nigeria, Chad, northern Cameroon, Sudan (including Darfur and the south of Sudan) and Eritrea. Arabe. Côtière ou large, une côte au désert du Sahara. Aussi région géographique en Afrique. Sahel include (d'ouest en est): le Sénégal, le sud de la Mauritanie, le Mali, le Burkina Faso, le sud de l'Algérie, le Niger, le nord du Nigeria, le Tchad, le nord du Cameroun, le Soudan (y compris le Darfour et le sud du Soudan) et de l'Érythrée. The Sahara desert occupies 4.6 million square kilometers or 10 per cent of the land mass of Africa. The fauna of the Sahara is relatively rich: there are 70 mammalian species, 20 of which are large mammals; 90 species of resident birds, and around 100 species of reptiles. Fiddling in biodiversity hotspots while deserts burn? Collapse of the Sahara’s megafauna. / : S. M. Durant et al. Diversity and Distributions, 20, 114–122, 2013. Unravelling biodiversity, evolution and threats to conservation in the Sahara-Sahel. / : Jos´e C. Brito et al. Biological Reviews 89 (2014) 215–231, 2013. Western Sahara—The Destruction of Biodiversity by Modern Colonialism. / : Axel Goldau ; Translated by Nele Saworski With Delicate Fine Paintings by the Sahrawian Artist Fadel Jalifa. Kritische Ökologie Online Special, May,2008. UNEP (2012). Sahel Atlas of Changing Landscapes: Tracing trends and variations in vegetation cover and soil condition. / : United Nations Environment Programme, Nairobi. Ecologically Sensitive Sites in Africa. Volume 5: Sahel - Washington, DC, USA , World Bank, 1993. History: Sahel has been colonized by the Roman Empire, the Ottoman Empire, France, Italy and the UK. Histoire: Sahel a été colonisée par l'Empire romain, l'Empire ottoman, la France, l'Italie et le Royaume-Uni. West African Arabic Manuscript Database 1987-. 'The West African Arabic Manuscript Database currently includes descriptive records of 20,000 Arabic manuscripts from West Africa', herunder Boutilimit samlingen, Kano arkivet, Niamey arkivet, Nouakchott arkivet, Segou samlingen og Timbuctu samlingen. Nordafrikanske krøniker fra middelalderen: Abd al-Sadi: Tarikh al-Sudan / Sudans Historie, 1653-1665, Ibn al-Mukhtar: Tarikh al-fattash / Forskerens Krønike 1665 samt den anonyme Notice historique ca. 1657-1659. Litteratur: Dubois, Félix: Timbuctoo the mysterious. - New York, Longmans, Green and Co. 1896. - 399 s.
Våbenfabrikker, våbenhandel og våbentransporter: Sahel countries boost military capacity : Maghreb countries are investing in weaponry as security challenges intensify in the region. / Jemal Oumar for Magharebia in Nouakchott – 04/11/1. ACAS Concerned Africa Scholars: US militarization of the Sahara-Sahel: Security, Space & Imperialism. Afrikas historie skal skrives om: Timbuktu i udkanten af Sahara er der dukket i hundredtusindvis af gamle bøger og manuskripter op, som er ved at ændre forskernes og verdens opfattelse af Afrika, fortæller Alida Jay Boye fra Oslo Universitet, der netop har udgivet en ny bog om Saharas intellektuelle skatkammer. / Lise Richter. 50. Lagt på information.dk 28. oktober 2008. Bragt i den trykte udgave 29. oktober 2008. Arabic literature in the eastern half of Africa. / Sean O’Fahey. European Union External Action Service: A Coherent EU Strategy for the Sahel / l En Sammenhængende EU-strategi for Sahel. 2012. - 39 s.
Textual sources on an Islamic African past: Arabic material in Zanzibar’s National Archive. / Anne K Bang. Intellectual innovation and reinvention of the Sahel: the seventeenth-century Timbuktu chronicles. Paulo F de Moraes Farias. I: The Meanings of Timbuktu. / Shamil Jeppie, Souleymane Bachir Diagne (eds). CODESRIA/HSRC, 2008, 416 s.
Investigating cross-border weapon transfers in the Sahel. / Conflict Armament Research Ltd., London, 2016. TV dokumentar: Link Media, Inc .Al Jazeera English - Witness: Timbuktu Scribes (2010). Timbuktu: Script and Scholarship. / Prepared by the Tombouctou Manuscripts Project and Iziko Social History Collections Department (Cape Town), 2008. - 136 s.
World Bank: Ecologically Sensitive Sites in Africa. Volume 5: Sahel (1993). - 144 s.